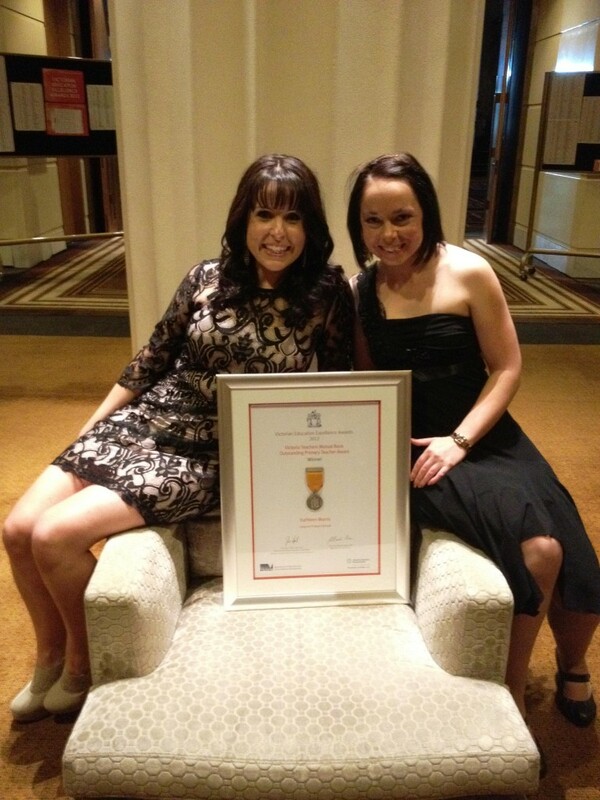 On Friday night I was honoured and humbled to win the Victorian Teachers Mutual Bank Outstanding Primary Teacher Award. This was part of an amazing night at the Victorian Education Excellence Awards at the Palladium at Crown Casino, Melbourne. The title is one thing but I am also extremely grateful to receive funding to attend ISTE in San Diego, meet with our “blogging buddies” and help other local schools get involved in blogging and global collaboration. I hope this award will ultimately have an impact on the education of many students. There was no time for public thank yous on the night but this individual award would not be possible without a great team of people around me! 2012 is the third year I have team taught with Kelly Jordan. This experience has been like no other professional development and the success we have achieved in our classrooms is definitely a team effort. Kelly deserves to be recognised as a big part of this award and I couldn’t have done it without her! This is the ninth year I have worked at Leopold Primary School. I’m grateful for the way the staff have supported me since I was an inexperienced graduate teacher, and allowed me the freedom to try new things. The liberty and trust to innovate is a real gift for teachers who can sometimes feel bound by regulations and uniformity. The students I work with make every day bright, interesting and rewarding. Seeing blog posts by former students such as BB, Rhiannonand Jarrod appear within hours of the news of my award is so touching. Within 24 hours of Kelly posting the results on our class blog, there have been nearly 30 comments from students and parents (on a weekend!). I’ve been lucky to be a part of the lives of many amazing students and families. My professional learning network is a huge part of my career and my life. Every day I am learning something from the educators I have met through Twitter, blogs and conferences. The messages I have received on Twitter and Facebook have been truly overwhelming. It has been a real honour to particularly work with inspiring teachers such as Linda Yollis, Shawn Avery, Jonah Salsich, Judy McKenzie and Melody Watson on a number of global projects and everyday blogging activities. They too are a huge part of this accolade. Once again, congratulations on your well deserved win. Being a lucky member of your PLN, I am grateful for the ideas and advice you always happily share with other educators. Friday’s award was clear recognition of that and may all the great experiences you have continue for a long time. Thank you so much! I bet excitement will be high at Bellaire tomorrow too. I’ve always enjoyed having you as part of my PLN too. I hope we get the chance to work together on something in the future. What an exciting night it was at table 43 at Crown on Friday! I am so happy I could be there with you, Nate and your family, it was a big thrill for all of us! Thank you for mentioning me in this post. We are really lucky to be able to teach together and our students benefit from our combined efforts. It’s hard to describe to others, but the environment in 4KM and 4KJ (and in the past, 2KM and 2KJ) is really special. We’re like one big team, all working and learning together. It will be strange teaching on my own while you’re in the USA! I know you’ll have an amazing time overseas, it is a great opportunity and I know you’ll make the most of it! It’s fantastic that so many students and parents have commented on the class blog about your award in the past 24 hours. What a lovely group of kids we have! I’m so happy you have been recognised for all of your hardwork. It certainly was an exciting night on table 43 and it was great to have you there. Yes, the atmosphere in 4KM and 4KJ sure is fantastic and it makes coming to work each day a pleasure. We’re lucky to work with such a great group of kids. Tomorrow will be a big day for all the kids! They’ll love seeing the award. Big congratulations on your award and thank you for the mention here. The best part of having a PLN is how we are all able to grow as teachers by sharing projects and by bouncing ideas off each other. I feel lucky to have all of you in my PLN! I’ll be excited to hear of your exploits when you and Linda attend ISTE in June. We will all be there with you both in spirit! So nice to hear from you. I too feel very lucky to have you in my PLN and I know we’ll have lots of fun working together in the future. I wish you could come to ISTE but I hope we’ll have a blogging buddy meet-up somewhere in the future! Congratulations! I could not be more proud of your achievement! Your dedication to children is extraordinary and your generosity and professionalism is remarkable. Even though we live on opposites sides of the world, I feel like we are colleagues working right next door. Lucky me! I am looking forward to presenting with you this June at ISTE. You were one of the first to know about my win and I’m so happy to share it with you! I too feel like I work just next door to you and I know we’re going to learn lots together at ISTE. Congratulations on your (very well deserved) award! As a member of your PLN, you’ve been a huge source of information, resources and inspiration. Good luck at ISTE – I can’t wait to follow your trip and experiences! Thanks so much for your kind words, Stef! I’ve really enjoyed getting to know you via Twitter and blogging! Well done and along with your other fellow friends am so over the moon on this wonderful award. Your passion is what drives BB and me wanting to learn from you and your amazing blogging pals you have around the globe. Also ten out of ten too Miss Jordan as you both really have got a special way of teaching together which I truly find amazing. I truly believe this is just the start of many more awards which are yet to come your way. Have a wonderful time when you go to the USA and please say hello to Mrs Yollis and Mrs Hembree from me. You and BB are a big part of this award as you’re one of the families who has embraced our blogging program to its full potential. I agree, Miss Jordan deserves an award too! I will be sure to say hello to Mrs Yollis and Mrs Hembree. I hope you get to meet them someday too. We might get them out to Australia someday! Congratulations Kathleen on a well deserved award. I can say I started my class blog based on the many tips you have shared and the enthusiasm you display in the abilities of your children. I remember one key moment of amazement for me when I read how your children tackle HTML coding with such ease. A fine educator brings out the best in everyone – both children and peers. Enjoy the accolades. Thanks for your lovely comment. I feel the same way about other educators. For instance, Linda Yollis is the teacher who introduced her students (and me) to HTML code. She has taught me so much and, along with so many others, is a big part of this award! Congratulations on receiving such a well deserved honor. I feel very fortunate to have you as a part of my PLN. Thank you for your thoughtful mention as well. Even though I work in a very small school I feel like I work with an amazing group of colleagues, even if we aren’t in the same building or even on the same continent. I hope you’ll have an amazing time at ISTE. I look forward to reading your tweets and posts! There are sure to be many tweets and posts about ISTE! Isn’t it wonderful that physical isolation is now no barrier for teachers and students. Good on you for embracing that. It’s a pleasure to work with you. Hi Kathleen. A well-deserved recognition of your enthusiasm and dedication to teaching our young people. That in itself is admirable,but beyond that you have been an inspiration and motivator to many educators around the world. Your generosity in sharing and encouraging others is something to be very proud of. Enjoy your visit to ISTE 2012. What a wonderful opportunity to meet your blogging buddy, Linda Yollis, in real life! Thanks for your thoughtful comment. I’ve really enjoyed having you in my PLN over the past few years. I look forward to meeting Linda and continue the sharing! I know you must be very excited ,but I agree with all your other comments – the award is well deserved. Your influence spreads far and wide and there are many educators, students and parents who have learnt to blog using your online example, without you even being aware of it. The staff and students at Queenscliff Primary are recent recipients of your generosity and have become confident bloggers because of your incredible ability to teach others. We are thrilled with the support and professional development you have given so that we can create our own website blog. What a lovely comment – thank you so much. I’ve really enjoyed getting to know you and working with Queenscliff as they begin their blogging journey. I’m sure you’ll get so much out of it. Wow! Congratulations! It’s really wonderful that you will be able to attend ISTE. I started blogging, tweeting, and building my PLN last year around this time and you were one of the first educators I followed. Thank you for setting a fine example to educators around the world! Hi Louise, thanks so much for your wonderful support. It is very touching! A huge congratulations to you. This award was so well deserved. I’ll try not to take too much credit for your win. It was probably only about 50% thanks to me! In all seriousness, we all definitely couldn’t be happier for you. We’re also excited about how it’s going to help you travel the U.S. so we all get the opportunity to learn from you! You were so confident that I was going to win! I didn’t want to entertain the thought too much….. but you were right! You were one of the first to find out about the outcome too! It’s been so great working with you and I really appreciate all of your support. Looking forward to the blogging buddy meet-up in the US! Congratulations on your achievement and recognition! You are such an inspiration to so many, and your award is well deserved! I look forward to meeting you in person at ISTE in a few weeks! Thanks so much for the congrats! I’m so excited to meet you. I know we’ll have a great time! Congratulations Kathleen. Thanks for sharing your tips and thoughts with colleagues and PLN. I look forward to following your exploits in the USA. Well done on a most deserved award. The thing that I notice is that you make everyone feel like they are a close friend, someone that you could go to and seek advice from. Your ability to achieve this is worth an award. You would be an amazing person to have on staff. As a member of your ever increasing followers I regularly check in for inspiration and updates. Just keep on being you, congratulations.